The eglu tour bus has been out on the road with Omlet’s merry band of men, women, chickens and rabbits playing to sell out crowds…we really must get round to recording a version of Old Macdonalds farm, could be a Christmas number one! We visited the National Gardening show in Somerset. It had amazing giant vegetable arena which was a surreal experience – almost as difficult to comprehend as some of the west country accents! This newsletter is packed with some extra goodies. 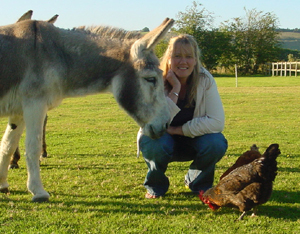 There is the very first Eglu Owner of the week, a fantastic recipe from Barbara’s collection for scotch eggs and lots of photos. Enjoy! Is this a giant marrow or just a small person? Are these large pumkins or a new style of eglu? Did you know that there are hens which can lay green and blue eggs? Amazing! Years ago, the only ones you could buy from the supermarket were white until they introduced the so-called “healthier” brown shelled egg. Silly really because eggs are healthy whatever colour the shell! The colour comes from the oviduct which is the last stage of the egg’s formation. During the last hours of production, the shell is formed and the pigment is deposited on the outside of the egg at this time. Strangely, you can rub off the dark brown pigment on a Welsummer’s egg while the duck egg blue of an Araucana’s egg goes right through to the inside. Most dark brown eggs are white inside. If you are after a palette of different colours, perhaps you should consider that Leghorns lay white shelled eggs while Rhode Island Reds and Faverolles produce softly tinted brown shelled eggs. Anconas and Silkies lay creamy coloured eggs and Araucanas will produce wonderful greeny blue ones. Cotswold Legbars eggs are almost sky blue and Barnevelders have deep brown shells. Speckledy’s produce shiny chestnut eggs with dark brown speckles all over them. 1. Hard boil the eggs and leave to cool then remove the shells. 2. Take the sausagemeat and divide it into 4 portions. If you are using sausages, skin them first before dividing into portions. Flatten out each portion and place a hard boiled egg onto the centre of each one then mould the sausagemeat around the egg so that it is entirely surrounded by meat. 3. Roll the sausagemeat covered egg in seasoned breadcrumbs and bake in a preheated oven at 200C for 30 minutes. Serve either hot or cold. Delicious! For a healthier version, use half fat sausages. Thanks Gwen for this wonderfull photo! Hobbies: Cars (we own 4), gradually turning our home into a miniature zoo (don’t tell my husband: he hasn’t realised yet), eating and drinking. What pets do you have: 2 dogs (Airedale Terrier and a Collie x). 2 rescued donkeys (Misty and Boots) and of course, “the girls”. We also “rent out” some of our land to whoever wants it: We’ve had 6 various horses staying with us and a flock of 40 sheep. Next spring we are buying 2 pigs: A breed from New Zealand, called Kune Kune (pronounced Cooney Cooney), who look like little wild boar. They’re the smallest breed of pig in the world and are exceptionally friendly and domesticated, as they used to live in the Maori’s homes with them. Our two will live in the paddocks however, not in the kitchen! Chickens: 2 (a Pepperpot and Gingernut). We got them at the end of May, so still quite young. Called Crockett and Tubbs. Because we haven’t owned a TV for about 15 years and Miami Vice was just about the coolest programme on when we gave it up! Eggs: We get around 10 a week. How do we eat them? Ermmm, I don’t like eggs! Jon loves fried egg with our traditional breakfast every Sunday after we have mucked out the donkeys, I love using them for quiches: Never made one until a few weeks ago, and can’t believe how easy they are and how much tastier home made ones are to shop bought ones! We’ve suddenly gone quiche crazy! Our friends, when we said “we’re getting chickens” thought we really had lost the plot: foxes, rats, poo etc. We didn’t tell them about the Eglu, so I guess they were imagining a more traditional set up. However, when the girls arrived, we threw a massive “hen party”, inviting over 40 of our friends and neighbours down to meet them: It was a beautiful evening, and we hosted it in the garden, with champagne, music and nibbles. 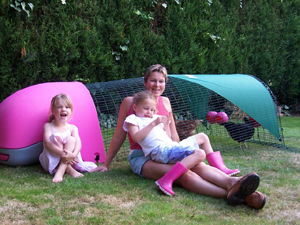 When people saw the Eglu, it blew their minds! It really is such a cool design! Many of our friends have design backgrounds, so of course, they loved its functionality and appearance. Others just fell in love with the girls, who were the absolute stars of the show! I think they must have thought, “Blimey, its alright here innit? Plenty of entertainment”! 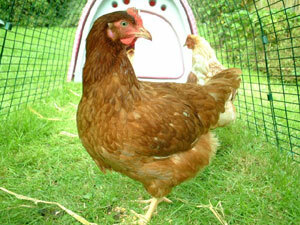 And of course, now the eggs are flowing, the girls are universally popular! We have now moved the girls onto the paddocks to keep the donkeys company, and their party trick is to flap up onto the donkey’s backs and pick off the flies! The donkeys love them! They can also do the 100 metre dash quicker than Linford Christie if the prize is a few bits of sweet corn: Their favourite treat! What question have you missed? How about, would you ever give your chickens and Eglu back? And the answer is a resounding “no”, after a few weeks of wondering if we were “doing it right”, we’ve relaxed into ownership and now absolutely love their antics and characters, and the eggs of course! The Eglu is just amazing. Chickens are by far the easiest pet I have ever owned. This great book will prove an essential reference for all who really are interested in providing the very best for their rabbits. The three sections ‘Principles of rabbit keeping’, ‘Health care’ and ‘Rabbit breeds’ will enable you to fully understand your rabbits needs.